Students will start out with a 2 day Basic Keelboat Class (ASA 101) on a monohull sailboat in San Diego Bay. The following 5 days are aboard a large catamaran that will head north to Catalina Island with stops at other harbors during the trip. 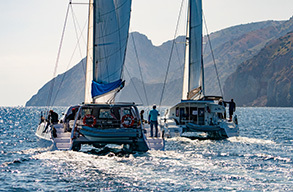 In these 5 fun-filled days you will complete Basic Coastal Cruising, Bareboat Charter and Cruising Catamaran Classes. This educational adventure will prepare you to pursue your sailing dreams.